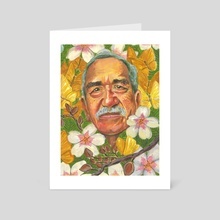 Nobel Prize-winning author Gabriel Garcia Marquez is one of the most influential writers of all time, with such seminal works as One Hundred Years of Solitude, Love in the Time of Cholera, and Eyes of a Blue Dog. Born and raised in New York, I was a first-generation child of immigrant parents and spent a great deal of my childhood years scribbling and sketching, dreaming and imagining. I’m currently illustrating my first book, ‘Mr. Blue,’ written by Peter Frazier and published with Maclaren-Cochrane Publishing. I hope that in my pursuit of writing and illustrating, I will be able to create stories that retain both originality and my particular sensibilities. I am currently a student of the MFA in Illustration program at the Hartford Art School and a member of the Society of Children’s Book Writers and Illustrators.